This autumn, Pace Hong Kong will present Sketch, a project by leading contemporary conceptual artist Song Dong to follow his 2013 appearance at Kassel documenta and his solo exhibition at Pace in New York. This exhibition project, which will open simultaneously at Pace Hong Kong and the nearby artistic and social venue Duddell’s, conveys Song Dong’s life-based approach to creation. The exhibition theme unfolds around the concept of the “sketch.” The artist believes that the sketch exists as a continually progressing and changing unknown preceding the completed artwork. Such change is a very important element in Song’s work, rooted in the constant fluidity of life. The artist also employs traditional cultural forms as a discursive method, transforming them into artworks with strong personal traits that express form as content. Song Dong: Sketch, simultaneously presented in two spaces, is an indivisible exhibition: Pace Hong Kong is an art exhibition space that is also a spiritual space; Duddell’s is a living space that also presents art exhibitions, a space that is at once spiritual and living. A sketch emphasizing life stacked together with a sketch emphasizing spirit serves as the artist’s discussion of the overall state of life. Pace Hong Kong will be presenting Song Dong’s latest series of “Sauce Paintings” between October 7 and November 7, including Taste Circuit Wiring Boards and Mandala. In these works created using sauces and spices from around the world, what appears as abstraction is actually rooted in life. With soy and chili sauce, he has transformed the concrete circuit board into an abstract painting. Adding white MSG powder to allude to artificial flavor, Taste Circuit Wiring Boards comes to represent the control that electronic products have over our lives, an invisible source of constraint. Mandala has its origins in Buddhist ritual, where an image is created in a painstaking process of laying out crushed gem powders in an intricate pattern, only to be swept away and returned to a void state at the end. 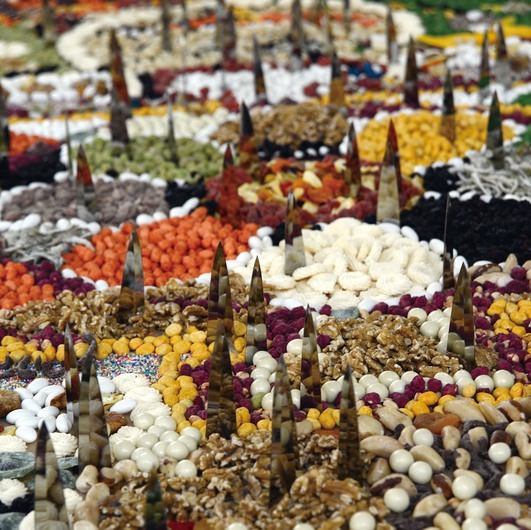 Song Dong found inspiration here, basing his image on the spiritual signs found in mandalas, laying out the pattern in many layers of sauces and spices. The use of seasoning as a medium shows us what a sketch of life really is, and how ordinary foods can become art. In the other space for Song Dong: Sketch, Duddell’s, a social and artistic venue two blocks from Pace Hong Kong, will be presenting the artist’s abstract concepts of life. In this space, Song Dong uses tape to delineate the space with a series of measured lines, turning an architectural space into a sketch, and making the venue, as well as everyone in it, into components in the artwork, using their physicality as a vessel for the artwork. The ceramic pots within appear as altars for bonsai scenes created out of cabbage, fish heads and pig feet, scenes that appear realistic but in fact have reached another realm of imagery. The use of white food items forms another window into understanding the loss of life. The space will also present photographs of the artist’s Edible Cities series, installations recreating cities around the world in edible form, documenting their connections to food and life as they occurred within their original exhibition spaces, further depicting the concept of spiritual sketch. Courtesy of the artist and Pace Hong Kong, for further information please visit www.pacegallery.com.